After a four year construction process, DPR's new Palomar Medical Center opened to the public in late August. The hospital's historic opening commenced when over 100 patients were transferred from the existing medical center in downtown Escondido to the new Palomar Medical Center in western Escondido. The project team used a collaborative, hybrid integrated project delivery model with numberous lean processes to build the new hospital. Designed by CO Architects, the state-of-the-art, 11-story, 740,000-square-foot, 288-bed facility is one of the most technologically-advanced hospitals in the nation. Eventually, it will be built out to 650 beds. This world-class healing environment is also one of the largest new hospitals built in California and is designed to meet both current and future needs of the community. The hospital provides inpatient care as well as surgical, rehabilitation, and emergency and trauma services. Innovative features include: all private patient rooms with flexibility; secure wireless network; expanded trauma and emergency services; a 1.5-acre green wavy roof, natural lighting and sustainable materials. About 1,700 employees will work at the new hospital and staffing could eventually grow to more than 2,000. 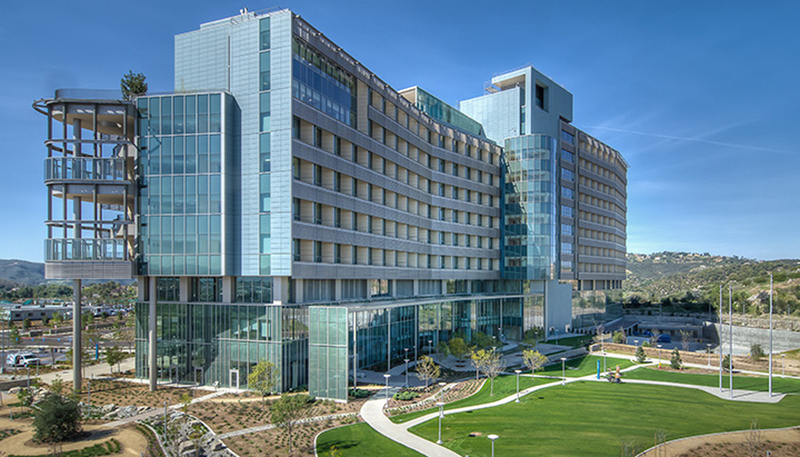 Palomar Medical Center was featured in DPR's Future of Healthcare study. Read about the Future of Healthcare here.